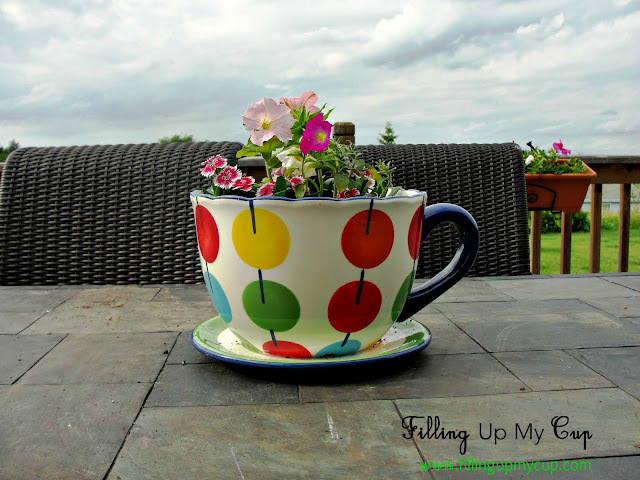 Update: If you happened to land on this post because you were searching for where to buy a "coffee cup flower pot" I got this one at Menards, but you can find them at most major home/gardening stores. A quick post to share a few pictures of the new flower pot I got the other day. I saw these outside of a little cafe in my town and went on a mission to find one for myself. You can read about my find here. I can not tell you how inexplicably happy this coffee cup flower pot makes me in all it's quirky polka-dotted glory. Miss A had to get into the action. She got a watering can from the Easter Bunny and never misses an opportunity to use it. Incidentally, would anyone like to come over and stain my deck? I just saw these this morning at Wal-Mart for $14!! They are so cute!